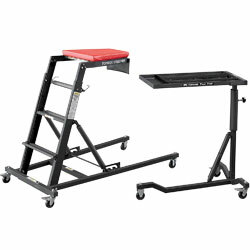 Reduces back, leg, and knee stress during maintenance jobs. Locking angle adjustment can be set in one of three positions. Slip-resistant steps. 3" locking casters. Heavy-gauge steel frame with powder coat finish. 400-lb. capacity. Ships unassembled. IN STOCK.